 Fried extras with extra dazzle from Chef Jean-Georges Vongerichten. Spring onions, not to be confused with green onions, a.k.a. scallions (photo courtesy Good Eggs). 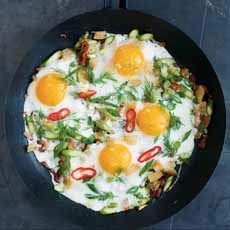 How does the great Chef Jean-George Vongerichten enjoy his fried eggs? With asparagus, bacon and crisp croutons. He recipe is quite simple. Since asparagus isn’t in season, feel free to substitute broccolini, broccoli rabe or green beans. 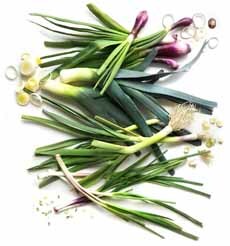 *Here’s the difference between spring onions, green onions (scallions) and their relatives. 1. COOK the bacon in a medium nonstick skillet over medium-high heat, stirring occasionally to separate the pieces, until golden and the fat is rendered, 2 to 3 minutes. 2. ADD the bread and asparagus and season with a small pinch of salt. Cook, stirring occasionally, until the bacon and bread are evenly browned and crispy, about 7 minutes. Stir in the onion and cook until tender and fragrant, about 2 minutes. 3. BREAK the eggs into the pan, letting the whites run together. When the bottom just sets, sprinkle the chili, dill and a small pinch of salt over the eggs. Cook until the white are set and the yolks are runny, 3 to 4 minutes. Serve hot.